“Jennie, can we sing again? 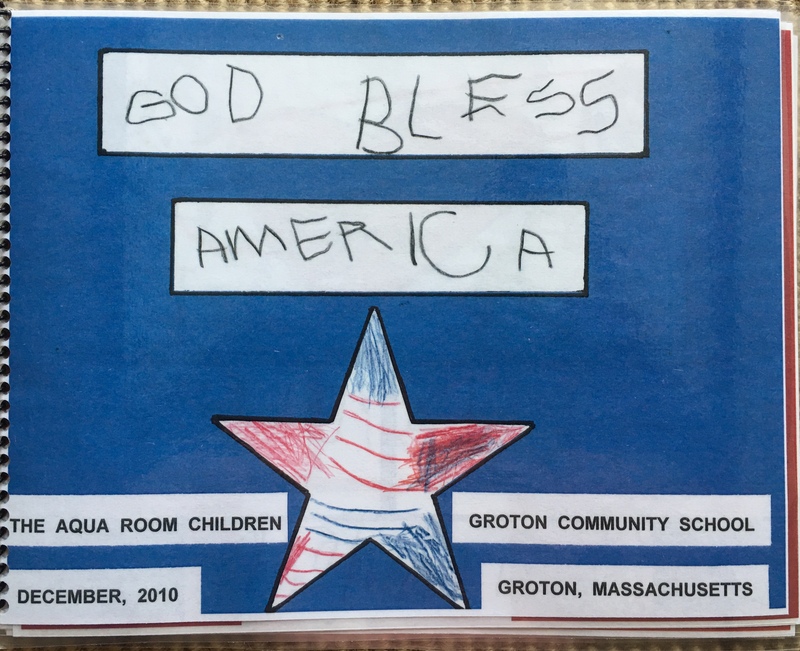 Can we sing “God Bless America?” This was what I heard from children, every day. I sing many songs with children, all kinds of songs. So, why was this particular song the favorite? I don’t know. But, what I do know is to pay attention to children and what they gravitate towards. My lesson plans might be terrific, but I know intuitively that what children are drawn to is far more important. I paid attention. And it grew. When children were in the playground they started singing on their own for other children. They sang all the time for Milly. She joined in, and she loved it! I had to do more, because the children wanted, needed, more. Veterans Day arrived and we invited soldiers into the classroom to say Thank You, and of course to sing. Lizzie’s favorite book was an everyday staple. 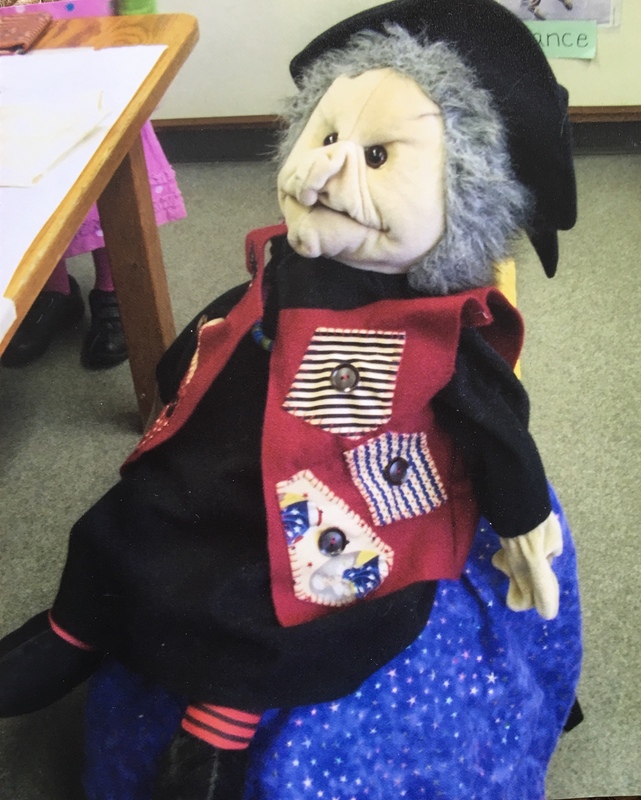 Milly spent time at school making a red, white, and blue outfit for Gloria- at the request of children. When the holidays were approaching, I had this pit in my stomach. I just felt like I was giving hungry children little bits of food instead of a big meal. 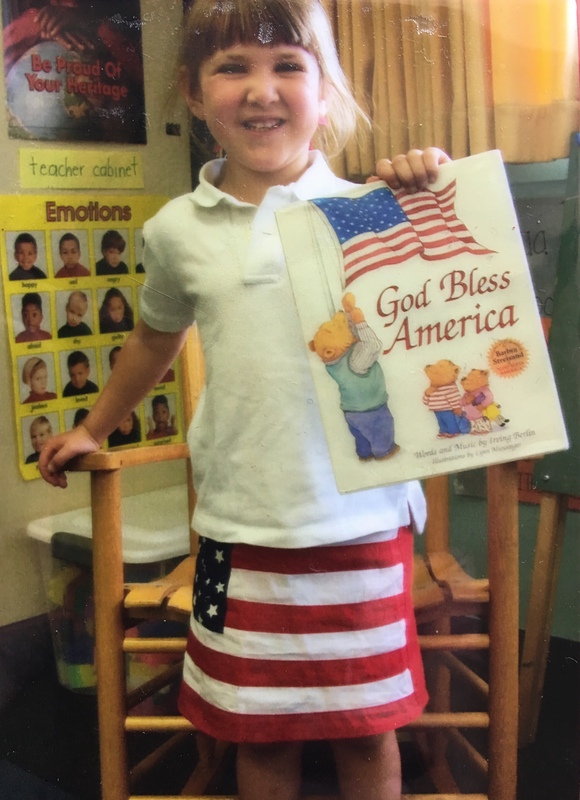 So, I decided we would make a God Bless America book for families as a holiday gift. This would be our own version, based on Lizzie’s favorite book. What a treasure this book became! We wrote all the words and made our own illustrations. When the holidays were over and we were back to school, things really hadn’t changed. Children built a ‘hill’ in the snow as their stage to sing. They were often on the soccer bench at the far end of the playground. I could hear their voices raised in song. Everybody could. Jennie, the children are trying to tell you they want more. Pay attention. Do something! I called Milly. 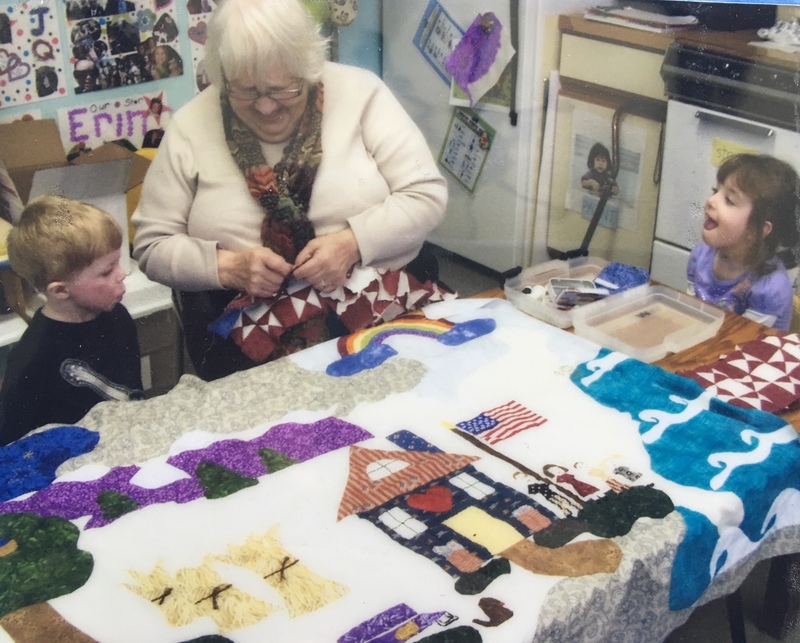 “Milly, do you think you could make another quilt with the children?” That was like asking a child if they wanted candy. And so, we began another quilting adventure. We already knew what we wanted to have on the quilt, as we had memorized the song – singing it a zillion times will do that. We had also made our book that illustrated all those words. But, we needed to put everything into one picture for the quilt. Again, children made all the decisions as to what would go where. Milly was there to watch. They colored the big sketch, which reinforced the words to the song, and reinforced what they wanted. It was their ‘statement’ and they were proud. I didn’t notice it at first. Do you see the large white center? That’s the United States of America. In New York, there is the child’s Statue of Liberty. There’s “night” and the “light from above”, “mountains” and “prairies” and “ocean”, and of course “home sweet home”. I wish you could see this in the flesh. 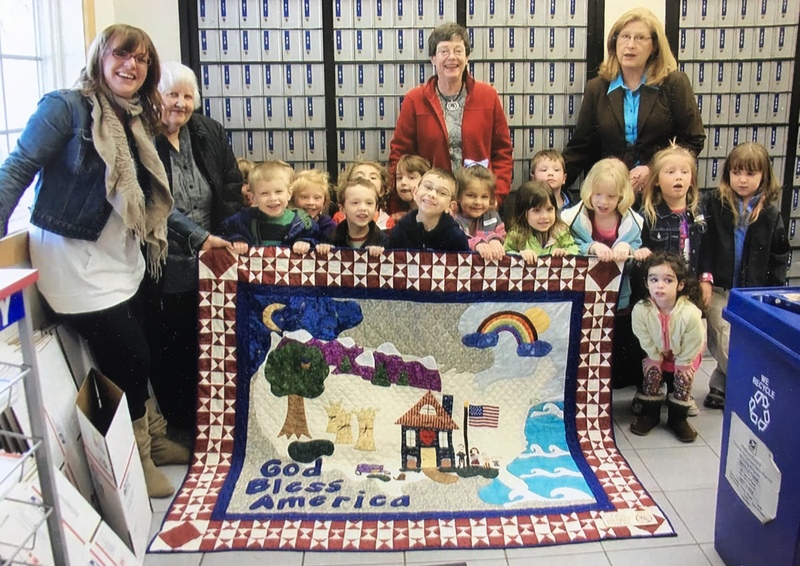 The newspaper wanted to do an article, and the Post Office wanted us to hang the quilt for ‘the world’ to see. Milly was now quite well known! “Jennie, where will the quilt go?” People were starting to ask. The Postmaster wanted to know. Our school’s director wanted to know. Milly hadn’t asked me…yet. And then it came to me. The quilt was museum-worthy, much like the Peace Quilt. But, I wrestled with what museum would be best and most appropriate. My first thought was the song, “God Bless America”, and I researched Irving Berlin and museums where much of his memorabilia is located. The museums, while wonderful, felt limited in the sense that our quilt was about far more than Irving Berlin. It was more about patriotism. Patriotism. I had hit the nail on the head in defining the quilt and where it needed to be. My husband immediately said, “Jennie, the most patriotic museum is in New York City. It’s a restored aircraft carrier, the USS Intrepid.” Why did I not know this?! I researched the museum (perfect fit) and immediately contacted the director, the ‘top dog’. To my surprise she got back to me right away. Boy, was she excited! So, we were off – again – with families and children in tow. Milly’s family made the trip, too. The event was far more than I expected… and it took a major turn. Stay tuned for Part 6. This entry was posted in American flag, art, Early Education, Expressing words and feelings, Family, geography, history, Imagination, Inspiration, military, museums, patriotism, quilting, Singing, Teaching young children, The Arts, wonder and tagged "God Bless America", Imagination, Inspiration, Milly, Milly the Quilter, patriotism, quilting, Quilts and museums, Teaching children. Bookmark the permalink. I love this quilt too. What a story this is!! Thank you, Darlene. What a story, indeed! Looking forward to part 6! But this part was great too. I’m so glad you could see the detail, Pete. I don’t know how Milly did it! Many thanks, and yes, I believe you will enjoy the Intrepid Museum (and more) in part 6. Best to you. I love how you listen to your natural instinct to feel what the children want even though they can’t quite articulate it. The border on that quilt is a lot of precision work itself. Would scare the stuffings out of me. I love Gloria’s new vest! How fun. Your kids in the aqua room are so very blessed to have you reaching beyond the norm on their behalf. Looking forward to the next chapter. Thank you, Marlene. Children often have a hard time articulating their thoughts. I remember Milly telling me about the border. I wish I could recall what she said, but I know that it was difficult, and something very different. She was quite proud and excited. I’m so glad you are enjoying these stories. More ahead! So many people touched by these two projects, Jennie. Wonderful! Yes there were, Steve. Thank you! It’s been an awesome series so far. I’m looking forward to the next installment. It would make a fabulous children’s book, you know…..
Firstly: “I was hoping you would say that.’ Sometimes all we need to do is ask, right? 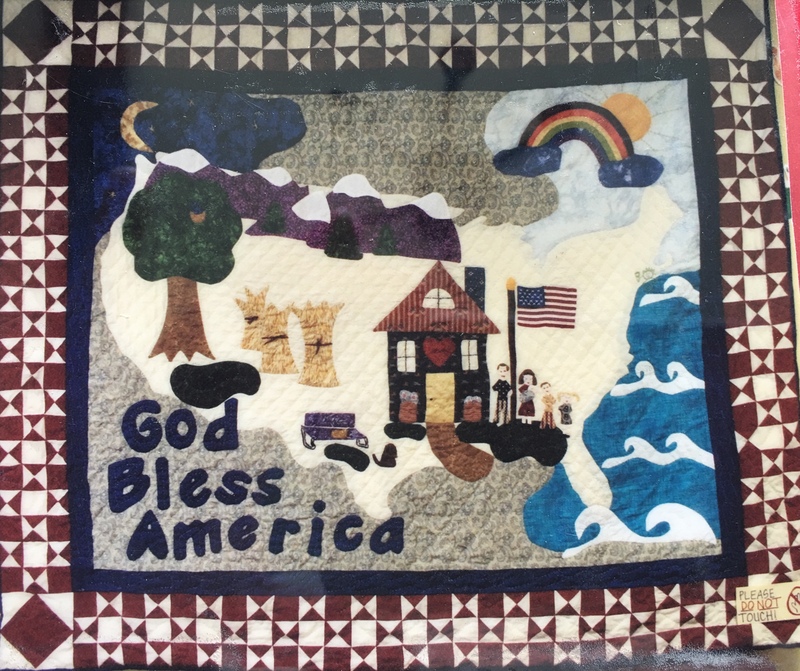 Thirdly: Quilts and the USS Intrepid – more incentive to tour that ship! PS – love Gloria’s vest! Wow! Your Dad was stationed on The Intrepid!! It is worth the visit as a museum. The aircraft on the deck alone is amazing. Down below, I remember all the brass. Quilts and the Intrepid… you will definitely need to read Part 6 to see what happens. And yes, sometimes all we need to do is ask. 🙂 Thank you so much, Laura. It is wonderful that Millie and your (and the children’s) quilts are hanging in museums all over America. I love the Intrepid Museum. I’ve been there at least half-a-dozen times, both before and after the renovations! This story is so interesting, with its twists and turns. I’m loving it. The museum is remarkable, Dan. I love it, too. Besides all the aircraft on deck, I remember so much brass below deck. More twists and turns ahead. I’m so glad you’re loving the stories. Thank you! Thank you, Sally! I tried to say thank you for your kind words and for sharing this next episode, but your site didn’t accept it. Could be the thunderstorms here. Milly and her quilts are amazing. quilt isn’t easy to make. How wonderful that it will be given such an honorouble home. Your kind words are greatly appreciated. Thank you! The quilt still takes more unexpected adventures. Can you imagine? As I’ve said this is a super story. Well done. Jennie. Much appreciated, John. I’m glad you’re enjoying this. I love this quit and this chapter of the story! Looking forward to reading what happens next! I’m so glad you’re enjoying this, Deborah. Thank you! That is so nice, Debby. Thank you. Yes, Milly was thrilled. 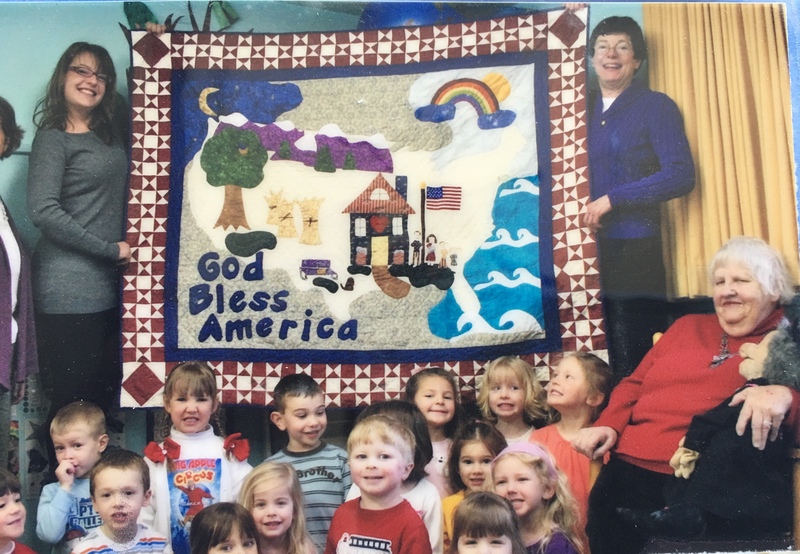 And the children love patriotism. They drove the boat! 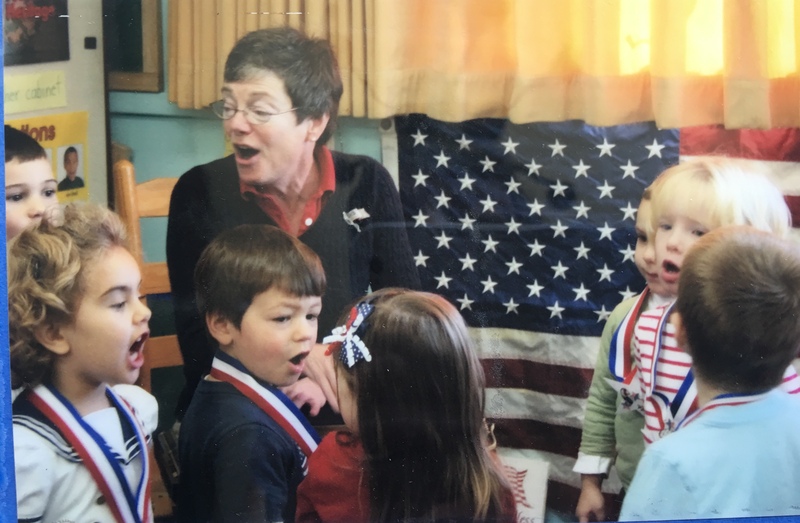 Jennie, I have never known a teacher like you … your energy, passion and commitment to teaching, to the children, is inspiring beyond belief. The joy of all you give is seen on the faces of the children, their keenness to give of their time and imagination. The quilt is exquisite and I am so in awe of you for finding a perfect home for it! A great recommendation by your husband and I look forward to reading the next part! Thank you, Michael. Best to you. What a beautiful quilt, Jennie. I would love to see it in the flesh. Thank you for describing it for me. 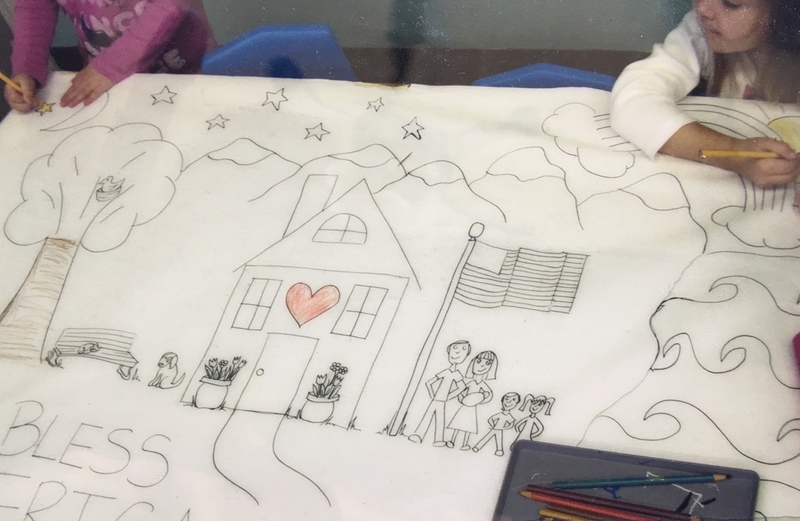 Well, I cried when I first saw it, like I did when I first saw the Peace Quilt. And, I’m not a crier. Thank you, Norah. The quilt came out extremely beautiful with so many layers of feeling stitched within. Thanks for sharing its journey! You are welcome, Marcia. It’s a wonder that Milly made the quilts by hand.